When the Union of Soviet Socialist Republics ceased to exist in 1991, propaganda art began to disappear, and once-grand social realist murals, reliefs and all manner of mosaics have dwindled. But in the Republic of Kazakhstan, locals still walk the streets under the watchful eyes of five-story tall cosmonauts, workers, engineers, scientists. The Kazakh version of Esquire recently published an amazing set of photos from the country's largest province, Karagandy—an area probably best known as the landing site of Russian spacecraft. According to the article, some of these monumental works are decaying, because they aren't protected by cultural heritage laws. At the same time, some of these murals are still excellent condition—commemorating a now-void vision of a heroic Soviet future. Unity of the working class, a large-scale mosaic on the wall of the House of Unions in the center of Karaganda, the capital of Karagandy Province. Battleship Aurora leads the working class, a nice combination of mosaics and bas-relief in Karaganda. 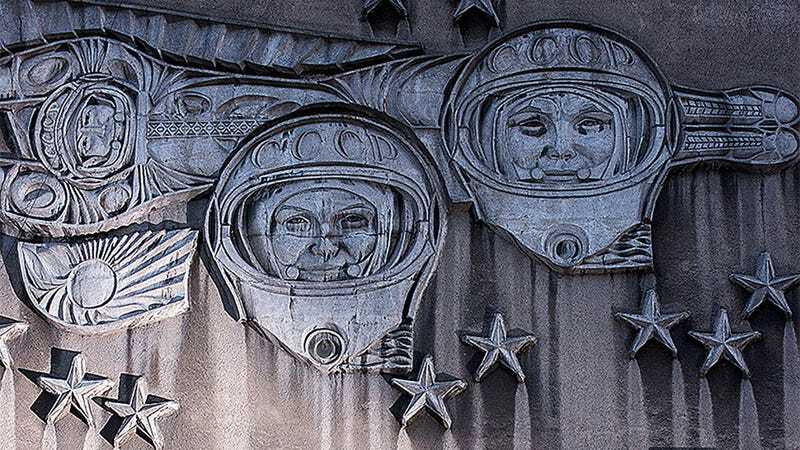 Merry cosmonauts of the Soviet Union, presumably Valentina Tereshkova and Valery Bykovsky (members of the Vostok-5 and Vostok-6 joint mission)—a relief on the facade of the administrative center of Karaganda. A miner gestures into the future in this mural made of colored glass and ceramic tiles at the entrance of the Dolinskaya mine, in Karaganda. A mosaic depicts the harmony of peoples and science in this mural, on the side of the House of Culture in Karkaralinsk. A glittering glass mosaic shows a miner in Aktas, Karaganda. This heroic bas-relief sits on the wall of a former water plant in Karaganda. Its sculptor, Yury Hummel, now lives in Germany. Several years ago, this mosaic of Yuri Gagarin—the Soviet Union's first cosmonaut to enter space—was completely painted over during the restoration of this building, in Karaganda. Fortunately, this artwork was later recovered and restored. A red and blue mural decorates the facade of the Stanislavsky Karaganda State Russian Drama Theatre. Builders of the future: These mosaics on the wall of the House of the Unions and the Tsentrkaznedra building in Karaganda are still in excellent condition.